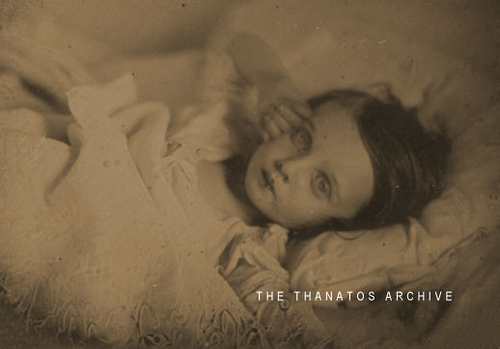 I thought long and deeply before posting the above image, portraying the last moments of a dying child (from thanatos.net). This child passed away in the 1880’s, and even if she had survived her 4th year of life, she would be long gone by now. I usually attempt to post only what I think is fairly non-controversial, with the requirement that what I write here should have some emotional impact on me. This picture had such an impact. It is actually quite uncommon for me to experience a strong reaction to all the images floating around the Internet; if I can’t touch an object, hold the photo, somehow have a direct experience to provoke a feeling, I usually do not respond. In this case, however, this little girl is looking directly into my soul. I am devastated by what her eyes say to me. Here, she is beyond pain and suffering; she has given up the battle and is waiting to die. Whatever fear she may have felt, whatever monumental effort she might have endured to survive, has vanished now. There is an infinite sadness in her face and her gesture, an exhaustion so profound that she can hardly keep her eyes open for the camera. I have seen the look of illness in my own face, when I was only slightly older than she is here. I was in the hospital, bone-thin and very, very sick. I found a picture that my father had taken of that painful period in our family history, and I had a similar look on my face as the child here. It was frightening to see; I can only imagine what emotions were tearing apart my parents during those endless days after the surgeries. I survived, clearly. I had the advantage of antibiotics and modern technology to pull me from the brink. This little girl had no such advantages, and she succumbed shortly after this picture was taken. Even though the picture of me was similar to this little girl’s, there was one difference (and I don’t yet have the heart to post that picture of me, because I don’t want my parents to see it) in our faces. There is still a spark of will in my five-year-old countenance; you can see I’ve been through hell, but I’m not through. I had some awareness, even then, that I wanted to fight for my life–no matter how painful–and so I still fight. There is no fight, no will, left in the child’s face above. Her little life is over. She has accepted it. God knows if she has any understanding of life after death, or if her parents were comforted in their faith. Her eyes do not show any hope, any glimmer of impending joy; it’s too much to ask of her. She was given the gift of life and it was taken away before she ever had the chance to run with a puppy or giggle in a field of flowers. If anyone deserves another chance at life, it is this child. I send her the poverty of my love, for what it’s worth, wherever she may be now. This scares me. Yeah, I know, there are lots of reasons why someone might dispute the veracity of this picture. That’s just par for the course with the paranormal. No one believes photos or audio clips or videos or ITC because it’s POSSIBLE to fake it all. However, I leave open the possibility that the above picture is real. It was taken by the woman’s husband at Gettysburg, and he seems quite convinced of its authenticity. With such a rich history of fraud, it’s no wonder that all things paranormal are so tainted. 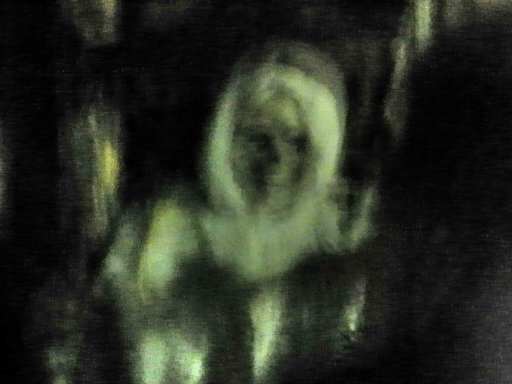 There are only a handful of mediums and psychics than can be trusted, and then there are all of the ghost hunters (myself included) that don’t really know how to interpret our data (no one can claim that he/she knows for sure what speaks on audio or what has manifested in a photo). The more I read on the history of parapsychology, the less I can claim with 100% certainty. I can only say that something beyond our understanding occurs on a regular basis. Back to the point: that picture scares me. However, something else has scared me recently–the uncertainty of what lurks in the dark at the sites where we (the Paranormal Housewives, that is) have been investigating recently. The church in Brea where my necklace incident occurred has a post script that I never told anyone about. If you recall, the necklace almost strangled me at the first investigation before flipping up and under my shirt. We tried to repeat the incident at the last Brea investigation, but to no avail (I find that such paranormal phenomena almost NEVER repeat themselves on command). When I returned home from that outing, three strange things happened. One, I heard a church bell in the living room (and my husband heard it to). Needless to say, there is no church bell in the living room. No, there was no cell phone capable of such a noise. There is nothing in the entire house that could have mimicked the sound of a huge, vibrating church bell. Second, one light in the bedroom went crazy, flickering on and off. That light has never done that before or since. We checked it and all was in order. Third, as I took off my shirt and the infamous skull necklace, I noticed that I had deep imprints of the beads on the left side of my neck, and only the left side. I could actually make out the bead pattern in my skin. Why only one side? I had not slept with the necklace on. I had not leaned on anything so hard as to make that kind of impression. Also, I have to say, that side of my neck now has a permanent rash where the beads were mashed into my skin. I kept all of this to myself because the idea that something followed me home scares me. It scares me because there is a certain violation of personal space and privacy when something unseen decides to pop up in your house, in your BEDROOM. Nope, I don’t care for that at all. Also, there was an incident awhile back regarding EVPs from this location that a contributor to the PHW website picked up while listening to the audio clips. He said he heard terrible, demonic voices on more than one of the clips. I can’t verify that, and neither could any of the other ladies who listened several times to those clips. I do not, therefore, necessarily agree that there is anything else there other than what our group heard. My mind wanders back to the book I am currently reading (In Search of the Truth by Ruth Montgomery, 1966). The author tries to convince her readers that spirit divination is sanctioned by the Bible. I am convinced by her arguments. Then, of course, to balance this view, I read all about how spirits are simply on only demons in disguise. I cover the topic quite thoroughly, and in the end, I decide that there is nothing wrong with believing in God, even in being a good Christian (and I am not saying that I am) and “divining spirits,” which defines what ghost hunters do. Nevertheless, I am not sure. There is some nagging little seed of doubt about the whole enterprise. If you believe in the powers of Good, you have to believe in the powers of evil. “The Devil’s greatest trick was to convince humanity that he did not exist” (The Usual Supsects) and “just because you do not believe in the Devil does not mean he does not exist” (The Rite) have become two quotes that float around in my brain just when I have managed to convince myself that there is nothing scary about paranormal investigations. When I wake up at 3:14 AM (which I do almost every night) and the papers are rustling on my dresser, I am not convinced. When something sits on the edge of the bed for a bit and then gets up and leaves, I am not convinced. Those are the things that scare me.